Apple introduced iPad, a tablet computer for the new generation. The products of Apple Inc. are always known for their simplicity and clarity, iPad is one such new gadget. The functions of the iPad are more or less similar to the functionality of an iPod. . The iPad is designed to work as a laptop. It executes all the tasks of a laptop with the support of iPhone OS 3.2. It is quite marvelous to watch a thinnest gadget performing everything that a modern man expects from a laptop, a media player and a mobile phone. Apple iPads are designed stunningly to attract the younger generation. 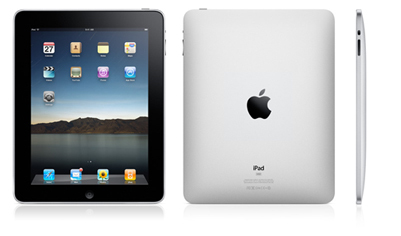 The dimensions of iPad are Height: 9.56 inches (242.8 mm), Width: 7.47 inches (189.7 mm) and Depth: 0.5 inch (13.4 mm). Apple iPads are free from arsenic, BFR, mercury and PVC. Recyclable aluminum and glass enclosure are used to design the iPads. Thus, Apple assures its commitment towards an eco friendly environment globally. The Wi-Fi model weighs 0.68 kg and the Wi-Fi + 3G model weighs 0.73 kg. . iPad is hefty when compared with iPhone but it is not heavy. The display of iPad is a real surprise to human eyes. It is quite convenient to watch the full size web page on a single screen on iPad. The tedious process of viewing a portion of a webpage on a smart phone or in an iPod is rectified in iPad. It is a breathtaking experience to the users of iPad when they use iPads to read iBooks. The 9.7-inch widescreen multi-touch display with IPS technology is further supported by LED-backlit glossy. The pixel resolution is 1024X768 at 132 pixels per inch. The display could be changed very quickly from portrait to landscape vice versa. People started commenting the iPads as iBook reader and iBook store. Really, the iBook reading is made very easy on iPad. There is no need to carry big volume of books when someone carries an iPad. The stunning display system enable the user to view the full size webpage, see the HD video very clearly, watch the TV without any disturbance and view the photographs so naturally. It is an exciting experience for all the users to watch the display of Apple iPads. The fingerprint-resistant oleo phobic coating avoids all finger marks on the display screen to a greater extent, which helps to view the iBook, photographs and video clearly. It is really interesting to see the amazing display of this thinnest tablet computer. Apple iPad has an A4 1 GHz chip ensuring its smart and fast performance. Apple iPad is configured with multi touch set-up, just by fingers one can move, scroll and click around iPad screen. No need for any wires and mouse to work on the iPad. The iPad screen is a high-resolution LED. One can easily run text applications, watch videos, surf the web and play games on iPad. Apple iPad offers the storage choice from 16GB, to 32GB, and even 64GB of storage. Much storage space is assured for photos, movies, iBook, music and other files. 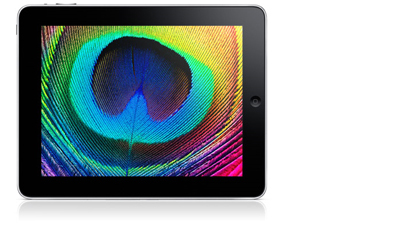 Apple iPad offers 3G models to transmit super-fast data on speeds that range up to 7.2 Mbps. The email management is so easy in iPad; the on screen keyboard and the split screen function to view both read and unread messages are added advantage. Viewing the photo album through iPad leads the user into a new experience, zoom in or out, slide show and importing the photo albums are made easy in iPad. The built in map navigates the user exactly to the destination. The calendar and notes of iPad helps to work everyone in an organized manner. The iBook feature is new and one can purchase and read books right off the built in “bookshelf”. The 30-pin dock connector, 3.5-mm stereo headphone jack, Built-in speaker, Microphone, and SIM card tray (Wi-Fi + 3G model only) ensures the complete requirement from a tablet computer. Apple iPad works on any Wi-Fi network. It has a built-in 802.11n permitting the connectivity on any wireless network. The iPad comes with Bluetooth 2.1 + EDR, which allows connecting to devices, cell phones, headphones and to Apple Wireless Keyboard. Apple iPad performs a lot which makes everyone to feel that the price is quite reasonable. The major variants are Wi-Fi and Wi-Fi+3G models, both model has three variants based upon the storage capacity they are 16GB, 32GB and 64GB. There is no camera in Apple iPad. Apple iPad lacks Flash support. Limited ability to do multi tasking. Hope Apple Inc. will come out with upgraded versions in near future having the above three features. iPad Case – It helps to protect the tablet computer from external forces while moving, further it acts as a frame stand for the iPad to watch the videos and slide shows quite comfortably. iPad Dock – It is useful to dock and charge the iPad, operate the accessories of camera connection kit and powered speakers. iPad Camera Connection Kit – The Camera Connection Kit enables two ways of importing photos and videos from a digital camera, either through the camera’s USB cable or through the SD Card. iPad USB Power Adapter – The 10W USB Power Adapter permits to charge the iPad directly through an electrical outlet. Don’t miss to experience the great performance of Apple iPad, feel it personally along with the accessories. It is worth buying an Apple iPad instead of a new laptop.